Nat Faxon (who you may have seen playing bit parts in Broken Lizard films and playing the title male on the unfortunately short lived TV show Ben & Kate) and Jim Rash (who you may have caught on the cult television hit Community) have Academy Awards under their belts. Their screenwriting, along with Alexander Payne penmanship, earned all three of them a prestigious Oscar for their adaptive screenwriting in The Descendants. 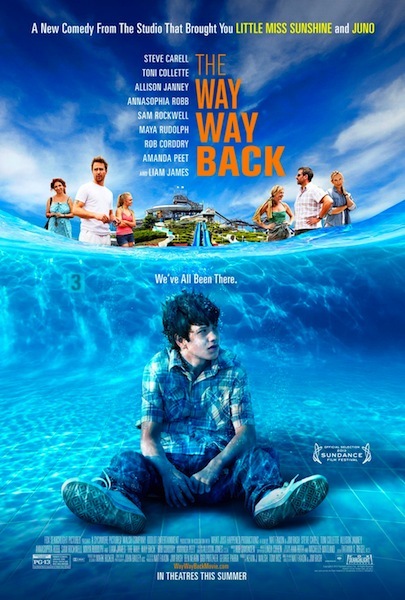 Now, Faxon and Rash have taken the reigns and co-directed/co-written their own indie entitled The Way, Way Back. The results are extremely amiable and it’s incredibly tough not to like or to find any flaws. It’s this year’s most eligible sleeper hit and also a well kept observational film about outcasts. Newcomer Liam James plays our young lead, Duncan. Trying to get through his early teens, Duncan spends all his time hanging out at home and accompanying his mom, Pam (played by Toni Collette). He has no interest in friends, romance, hobbies, or anything really. He’s content with being by his lonesome, but is aware that this isn’t exactly the best way to live his budding teenagehood. His Mom’s boyfriend Trent (played with versatile strength by an out-of-the-element Steve Carell) sees this and pushes Duncan to take more risks. Unfortunately, he does this by pointing out his weaknesses and subtlety berating him in front of company. When Trent invites Pam and Duncan to his summer home by the beach, it’s Duncan’s worst nightmare. Trent’s harshness doesn’t let up and Duncan’s even further away from anything he’s used to. James lays on the misfit mannerisms awfully thick, occasionally making Duncan’s out of place and unwanted appearance very obvious and broody. However, it’s a performance that becomes heartwarming and sweet once he finds his calling at the Water Wizz, a Never-Never Land of sorts disguised as a waterpark. Here, he finds the park’s owner Owen. Owen is played by a scene stealing Sam Rockwell who does what he does best – sharply charming, sarcastic, and highly likeable. He takes Duncan under his wing and shows him the ropes of the waterpark. Nothing is mentioned about Owen seeing a bit of himself in Duncan or anything else that follows a similar cliché. Rockwell’s welcoming clown just hates to see anyone having no fun. Some of the credit goes to the performances of Faxon and Rash, who also play scene stealing employees at the Water Wizz, as well as a sternly funny Maya Rudolph – who is usually seen picking up Owen’s pieces – regarding how the film stays in check with its fun-loving attitude restraining the film from becoming obnoxious. 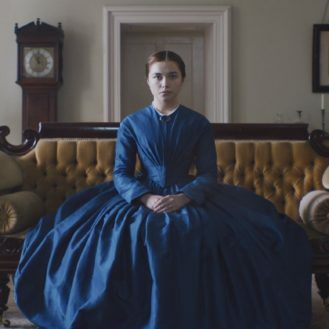 But, it’s the writing and the careful but caring direction from Faxon and Rash that is super mindful of what their sweet, little indie could blur into; and they do a terrific job at keeping their vision away from those pitfalls. The directorial duo take their time establishing the summertime environment before heading to the waterpark. But, the scenes showing how peer pressure affects Duncan’s mother amongst Trent’s sloshed cottage buddies (especially a cringe worthily hilarious performance by Allison Janney) is very effective and ties these themes of “feeling left out” into the adult world with ease. The film features many scenes of Duncan overhearing conversations and characters witnessing small mannerisms that offer a lot of insights on someone or something else. These characters are learning with the audience (sometimes through third party perspectives), which allows an element of common interactivity between movie goers and the performances. The Way, Way Back doesn’t treat these characters or the audience as buffoons. Some may act that way, but the film understands that their story can be taken just as seriously as any of the good-natured leads. 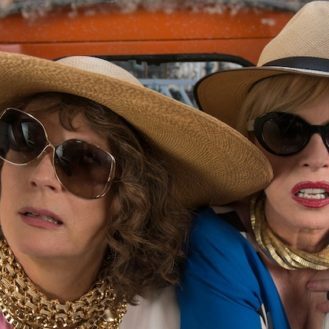 Since it is an observant film and goes at its own leisurely pace, The Way, Way Back isn’t exactly the flashiest or the most exciting movie you’ll see this Summer. However, the film may look routine, but this dramedy fills the quota from all ends with plenty of laughs and heart. Like a lazy river at a waterpark, The Way, Way Back allows the viewer to sit back and take in life’s quiet moments. Each situation is easily relatable, the performances are outstanding and genuinely funny, and the film’s smart dialogue – sans a mumbled, quick f-bomb – is never blue and manages to make you smile while staying impressively clean. The Way, Way Back is impossible to resist.